There are major implications for Window Frame and IGU manufacturers, as the Government seeks to meet its obligations on greenhouse gas emissions and reduced energy usage. In April 2010, the Department of Communities and Local Government published the 2010 version of the Building Regulations for England & Wales, with Approved Document L being of major interest to the windows & doors industry. This became a requirement from 1st October 2010. In summary, Window Energy Ratings (WERs) is a preferred means of compliance for replacement windows or those fitted into extensions. The minimum requirement from 1st October 2010 is now a C rating but undoubtedly higher requirements will be required in 2013 and again in 2016. Although a B rating had been expected in Scotland, publication of the Building (Scotland) Regulations 2010 again identified 1st October 2010 as the implementation date with a C rating being required, although fittings into extensions attached to buildings defined as being of ‘poor fabric’ need to achieve an A rating. In Northern Ireland, implementation was delayed but work is currently progressing on a new set of Building Regulations, which will be called The Building Regulations (Northern Ireland) 2011. From published consultation documents, It appears likely that Window Energy Rating of band C or better will be one means for compliance. With regards to doors in England & Wales, certainly in the short term, it would appear that a whole door u-value of less than 1.8 will be the main means for demonstrating compliance, while Scotland requires a value of less than 1.6. 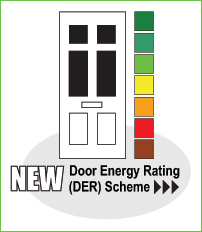 With the launch of thre BFRC door Energy Rating (DER) scheme in September 2011, it is anticipated that DERs may be introduced into future revisions of Building Regulations. This whole window u-value approach may also be used for windows but the requirement is for less than 1.6. For a limited range of applications, a centre pane u-value of 1.2 will be accepted. Manufacturers of windows, IGUs, rooflights and doors should seek advice from their suppliers or other independent sources. ER Certification Ltd. has have been approved by BFRC as an Independent Agency able to carry out on their behalf, assessments and audits at the manufacturers' premises. In order to satisfy the conditions for becoming an Independent Agency, we initially sought and gained UKAS Accreditation for Product Certification under EN 45011, then more recently under ISO 17065. Our Managing Director - Bill Keating - is a qualified Lead Auditor and as such will oversee all the assessments and audits required by the company. Bill will be taking a lead role in our offering in the UK of ISO 9001.2008 Certification in conjunction with TÜV Rheinland UK.